Fan Fave Comics and Star Trrek Writer Peter David Returns To Tell A Tale Of Captain Jean Luc Picard As U.S.S. Stargazer Captain! Solicitation and cover below. IDW 20/20 kicks off IDW’s year-long 20th anniversary celebration! An all-new weekly event giving a glimpse of your favorite characters 20 years into the future—or past! What made them into the heroes you love… and what twists does the future hold…? Twenty years before he took command of the U.S.S. 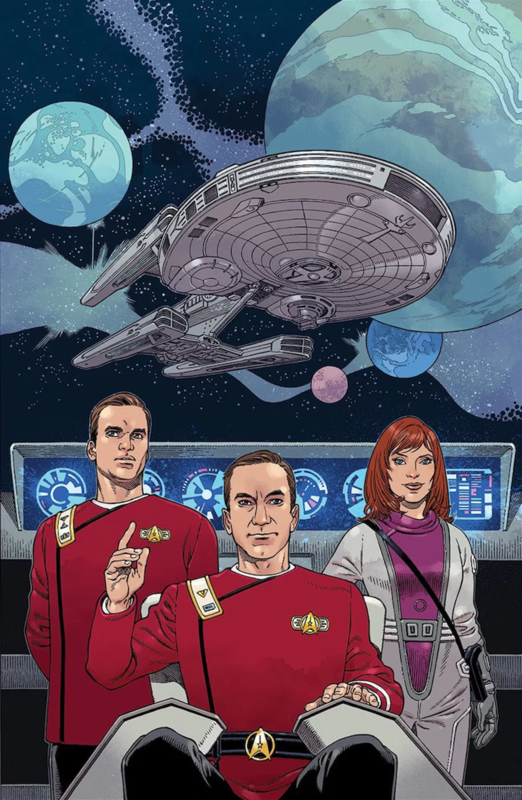 Enterprise-D, Jean-Luc Picard sat in the captain’s chair of the U.S.S. Stargazer. Picard served with distinction aboard the Stargazer for many years on his way to becoming the most respected captain in Starfleet. But in this early mission, Picard showed that even he is merely a man. Order 10 copies and get one free variant cover by Gabriel Rodriguez! – Featuring an adventure early in Captain Picard’s career! – Reuniting Fallen Angel dream team and Star Trek fan favorites, Peter David and J.K. Woodward! – Celebrate 20 years of IDW with new stories about your favorite characters!